My family and I tend to spend a lot of time outdoors, especially in the summer months. We go to the pool, zoo, vacations, baseball games, picnics, and so much more. One of the things I carry with me everywhere we go is sunscreen, and we slather it on every hour. My little sister was diagnosed with melanoma several years ago, and seeing what she has had to endure, I have promised myself that I will do my best to protect my family from the dangers that the sun can cause. Therefore, we tend to spend a fortune on high spf sunscreen. One of my biggest gripes about sunscreen is that it tends to be greasy and sticky. Sprays don't seem to work very well at providing great, even coverage. Sunscreen sticks get yucky to deal with after a couple of uses too. When I first heard about Neutrogena UltraSheer Liquid Daily Sunblock, I was hesitant to believe the claim that it is non-greasy. Even so, I was eager to give it a try. Tidal Labs sent me two bottles of sunscreen, and as soon as I received it, I cleaned my face and applied it underneath makeup. I was pleasantly surprised that the sunscreen dried quickly on my face and had no greasy residue at all. Then, I went to a baseball game. It was an extremely hot and humid day in the sun, and at the end of the day, my face and neck did not burn at all. The SPF for the Neutrogena Ultrasheer is 70, which is fantastic for my fair skin which tends to burn easily. I have also used the sunscreen on my sons and have had the exact same results. That makes me a very happy momma. I am happy to recommend Neutrogena UltraSheer to my friends, family, and blog readers. Would you like to review products, too? Apply at: http://www.giantwavepool.com/! 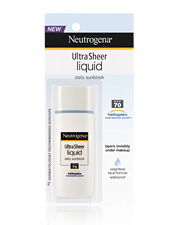 Or get $2 off your UltraSheer purchase at http://www.neutrogena.com/suncoupon. Disclosure of Material Connection: I received the product mentioned above for free for review purposes from Tidal Labs. I was not required to write a positive review. The opinions I have expressed are my own. I am disclosing this in accordance with the Federal Trade Commission's 16 CFR, Part 255: "Guides Concerning the Use of Endorsements and Testimonials in Advertising."